New Directions Publishing Corporation, 9780811217361, 322pp. Scathingly clever short stories. Includes "The Devil in the White House" and "The Development of Iraq as a Case for the Files." At once a genuine story-teller and a literary documentarian, Alexander Kluge's genius lies in the very special way he makes found material his own. Each of the miniatures collected here touches on "facts" and is only several pages long. In just a paragraph he can etch a whole world: he is as great a master of compression as Kafka or Kawabata. 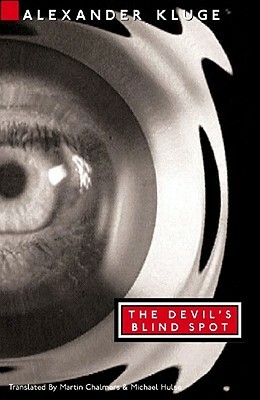 Arranged in five chapters, the dozens of stories of "The Devil's Blind Spot" are condensed, like novels in pill form. The first group of stories illustrates the little-known virtues of the Devil. The second explores love from Kant and opera through the Grand Guignol. The third is entitled "Sarajevo Is Everywhere" and tests how convincing power is. The fourth group concerns the cosmos, and the fifth ranges all our "knowledge" against our feelings. In each piece, Kluge alights on precise particulars: on board the atomic submarine Kursk, for instance, we are marched precisely step by step through a black comedy of the exact, disastrous stages of thinking that lead to catastrophe. Sample titles include "The Devil in the White House," "The Development of Iraq as a Case for the Files," "Intelligence of the Second Degree," and "Love's Mouth Also Kisses the Dog.